[S597] William Henry Perrin, History of Cass County, p. 287. Lucy Goodell was born on 28 May 1868 in Chandlerville, Illinois.1 She was the daughter of John H. Goodell and Harriet Abigail Sewall.1 Lucy Goodell graduated from Nurses Training School, Chicago.1 She married Dr. Andrew Struble on 9 June 1897 in Chandlerville, Cass County, Illinois.2 Lucy Goodellprobably died in 1920. [S89] Family Search, Illinois Marriages, 1815-1935. [S89] Family Search, Iowa, County Births, 1880-1935. [S83] NEHGR, Vol. 11 p. 158. [S89] Family Search, FHL Number 12021. Adelaide M. Gooderham married James F.W. Ross. [S151] Letter, unknown author to unknown recipient, 9 December 1796. Levi W. Goodrich, son of Noah Whitney and Abby (Porter) Goodrich, was born in Amherst, Lorain County, Ohio, May 31, 1836, and died in Marlin, Texas, July 29 ,1911. In 1845, his parents removed to Pittsfield, Mass., where he prepared for college. He entered the University in 1854, remaining until November, 1855. He engaged in engineering work in Chicago, Ill. from May, 1856-1857; in Wisconsin, 1857-58; Illinois, 1858-59. In 1859, he located in Brown County, Texas, where he taught school until 1860; was district surveyor of Brown, Coleman and McCullough counties, 1860-61. On the breaking out of the Civil War, he enlisted in the "McCullough'' regiment, and took part in the capture of the military posts on the Texas frontier in February, 1861. Soon after, this regiment was re-organized with Ben McCullough as colonel. Lieut. Goodrich was appointed adjutant of the Regiment, and served on the frontier of New Mexico until 1863, when he was commissioned captain Co. G, 30th Texas Cavalry. He commanded this company until the close of the war, taking part in many engagements in Texas, Arkansas and Indian Territory. He taught school in Robinsonville, McLennan County, 1865-66, at the same time studying law. He was admitted to the bar in Waco in May, 1866, and practiced his profession in McLennan and Falls counties for many years. He was admitted to practice before the Supreme Court of Texas in 1871, and before the Supreme Court of the United States in 1875. 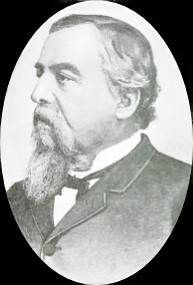 He was judge of the Nineteenth Judicial District, Texas, 1890-97. [S442] William Arba Ellis, Norwich University, Vol. 2, p. 605-606. [S336] Herbert Bemerton Battle, The Battle book, p. 647. [S205] Newspaper, The Dallas Morning News, 8 June 1906. [S336] Herbert Bemerton Battle, The Battle book, p. 648. [S232] Ancestry.com, Texas Death Index, 1903-2000. [S392] Website findagrave.com (http://www.findagrave.com/) "# 23370281." [S89] Family Search, Texas Deaths, 1890-1976. [S182] Elizabeth Cabot & James Jackson Putnam Putnam, Jackson ancestors and descendants, p. 34. [S581] Delmar R. Lowell, The Lowells of America, p. 223. Herbert N. Goodspeed married Carrie L. Snow.